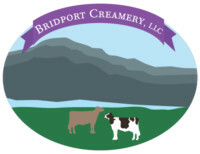 Nestled near the shores of Lake Champlain, Bridport Creamery brings you farm fresh Vermont made artisanal cheese. Some of our popular flavors include our own Swisserella cheese with Dill, Mustard Seed, Caraway Seed and Cumin. We also make farm fresh cheese curds- awesome for snacking, poutine and more. About Nicole: Nicole was born and raised on her family farm on the shores of Lake Champlain in Bridport, VT. Iroquois Acres was established over 50 years ago. Her family milks 325 cows on 1200 acres of farmland. Nicole has always been extremely involved in the dairy from milking to farm work. Nicole, her brother and sister have developed a well-known Brown Swiss herd of 110 including 50 milking cows showing nationally and sold for breeding stock all over the world. Nicole earned an Associate’s Degree in Agriculture Business from Suny Cobleskill. She returned to the family farm where she managed the young stock and dairy herd for 8 1/2 years. Her husband Mark is a trained mechanic, and works on his family dairy farm of 700 cows with 400 actively milked on 1800 acres in Middlebury. After their second child was born, they decided that two farms and two young children was too much. They relocated to Mark’s farm where they took over management of the milking herd. When both children were in school full time, Nicole decided she needed a change. Since 2009, she has been taking classes at UVM through the Vermont Institute of Artisanal Chees and expects to earn her Master Cheesemakers Certificate within the next year. Nicole has enjoyed creating quality, salable products that are unique to Bridport Creamery with initial offering including cheese curds, their own “Swisserella” available in several delicious flavors and eventually including aged cheeses, all built around her own Swiss herd. Open to the public but please call ahead. Cheese available for sale on site. Plain, Mustard Seed, Caraway Seed, Cumin – A mild, great melting cheese in plain and herbed. They make the best poutine and fried cheese curds, but most folks say they simply can’t be beat for snacking!